The following is the first post from our newest writer, Derek Albin. He currently contributes to Baseball Prospectus and has also written about the Yankees at the now defunct BP Bronx and It’s About The Money, Stupid. You’ll see his work regularly. You can follow Derek on Twitter at @derekalbin. Conventional wisdom can be trite, but sometimes it exists for good reason. The old adage that you can never have enough starting pitching is something said ad nauseam, but holds true. Just look at the Yankees last year: twelve different pitchers started and ten of them did so on multiple occasions. This season, we can probably expect something similar. Right now, the Yankees have baseball’s third-best projected rotation per Fangraphs. It’s pretty hard to knock a staff of that caliber, but if there’s any flaw, it’s depth. In particular, Luis Cessa, Chance Adams, Albert Abreu, and Domingo Acevedo project for 83 innings altogether. Decreasing that group’s workload would be ideal, and it looks like something the front office is considering. Even with pitchers and catchers reporting in just a few weeks, there are still some useful pitchers available in free agency. Like CC Sabathia, Miley appears to have saved his career thanks to an emphasis on the cutter. In the past, Miley had thrown four-seamers for more than half of his pitches. Last year, he started throwing his cutter more than 40 percent of the time to resounding success. His home run problems? Gone. He allowed just three long balls in over 80 innings. All told, Miley posted a career best 2.57 ERA, supported by a solid 3.59 FIP. Steamer foresees some regression, projecting a 4.36 ERA this year. Still, sign me up for that as a depth starter. Of course, why would Miley take on such a role? Given his revitalization and history of durability (29 starts or more annually from 2012 through 2017), he should be able to find a regular gig somewhere. Barring a six-man rotation, which is unlikely given the amount of off-days to begin the regular season, Miley would be in the bullpen to begin the year. Sure, someone could get hurt during camp, but that’s not something Miley will want to count on. Miley would be a nice-to-have option, but it seems like an unlikely union. Then again, free agency is a weird, weird place nowadays. It’s been over a decade now since Anderson was one of the top prospects in all of baseball. Injuries have held the southpaw back, but he has put together a few decent stretches at points throughout his career. Though he’s never been a strikeout artist, he’s consistently put together solid peripherals by throwing strikes without surrendering many homers. In a curtailed 2018 due to injury (shocking), he pitched to a 4.48 ERA and 4.17 FIP in just over 80 frames. Steamer expects more of the same: a low four ERA with some time on the shelf. His ability is tantalizing because he has the makings of a stellar fourth starter, but he simply struggles to stay on the field. For that reason, he might be hard pressed to find a guaranteed spot in anyone’s rotation. Should that be the case, the Yankees are a great fit. I’m sure that the front office would prefer a more durable fallback option, but from a talent perspective, Anderson is hard to top for this role. Like Miley and Anderson, Hellickson also spent time on the disabled list last year. When on the mound, though, the righty pitched well for Washington. He posted a 3.45 ERA and 4.22 FIP in a hair over 90 innings, which was a strong recovery from a horrendous 2017. In time split with Philadelphia and Baltimore that year, Hellickson recorded a career-worst 1.92 HR/9, 5.43 ERA, and 5.77 FIP. Hellickson’s 2017 is likely the reason for Steamer’s bearish outlook in 2019. Hellickson has always been a fly ball pitcher, so home runs are part of his game, but his highest HR/9 prior to 2017 was 1.36 in 2015. Most other seasons have been in the 1.1 or 1.2 range. Nonetheless, Steamer forecasts 1.59 HR/9, which balloons his projected ERA and FIP over five. I get that fly ball pitchers and Yankee Stadium don’t mix well, but when we’re talking about a sixth or seventh starter, beggars can’t be choosers. He might not be as good as he was in 2018, but I’m certainly not as low on him as Steamer. Finger injuries ruined Santana’s 2018. He made just five starts that aren’t even worth talking about. All you need to know is that he was horrendous. The two years prior are different stories, however. For the Twins in 2016 and 2017, Santana totaled 6.2 fWAR and ERAs in the low threes. Granted, Santana is now 36 and his best days are most certainly behind him. He can’t be that far removed from his 2017 ability though, right? Steamer disagrees and basically thinks he’s done as an effective starter, calling for an ERA and FIP above five. With his health and projection in mind, it’s a risky proposition to start Santana every fifth day from the get-go, so he will probably have to settle for the type of role the Yankees have available. There are a handful of others who’ve been around the block, such as James Shields and Jason Hammel. I’m not very confident in options like those two exceeding the contribution that Cessa et. al. could provide, though a minor league deal wouldn’t hurt. Ditto goes for hurlers like Edwin Jackson, Doug Fister, Josh Tomlin, and Yovani Gallardo. Let’s not mention Clay Buchholz; the thought of him in pinstripes is rather unpleasant. Finally, you might have noticed I excluded Gio Gonzalez, who although still available, I don’t think it’s worth considering because he shouldn’t have to settle. Thanks to the Dodgers, yesterday was by far the busiest day of the Winter Meetings. 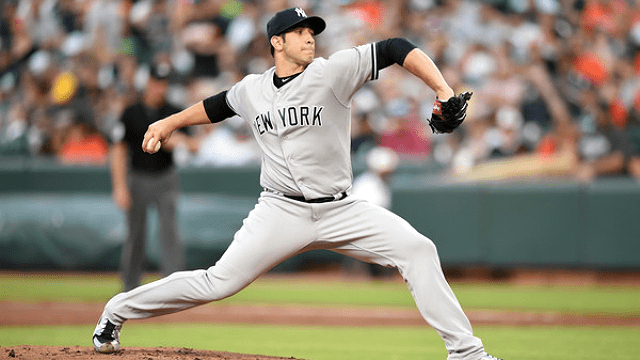 They made four trades and also agreed to a four-year contract with Brandon McCarthy, so he is no longer a pitching option for the Yankees. There are still plenty of quality pitchers left on the free agent market but they’re starting to come off the board pretty quickly, so the Bombers can’t sit around and wait much longer to act. The Winter Meetings have been relatively quiet for the Yankees. On Monday, Tuesday, and Wednesday we learned they continue to say they won’t bid for Max Scherzer, will give Chase Headley four years in exchange for a lower annual salary, have talked to a few teams (Braves, Royals, Marlins) about bullpen help, and have some level of interest in Stephen Drew, Sergio Romo, Jason Grilli, and Rafael Soriano. Today’s the last day of the Winter Meetings and we’ll keep track of all the day’s Yankees-related rumors right here, so make sure you check back throughout the day. All timestamps are ET. Despite their recent stretch of poor play (putting it nicely), the Yankees remain in the postseason hunt because every other team stinks too. The AL East is especially bad. The Yankees have lost nine of their last eleven games yet they remain 4.5 games back of the division lead with 79 games to play. They’re five games back of the second wildcard spot. Those deficits are far from insurmountable at this point of the summer, but they will need help to get back into the race and fast. Because so many teams are within striking distance of a playoff berth, there aren’t many sellers out there this time of the year. One club that has at least acknowledged the likelihood of selling is the Diamondbacks, who come into today with the worst record in baseball at 35-41. “Based on the last couple of years of being a .500 club and this year with the injuries we have and our record, we have to look at being more open-minded of moving some contracts and some veteran players for younger players,” said GM Kevin Towers to Nick Piecoro recently. Towers spent a year in the Yankees front office and he is reportedly very close friends with Brian Cashman, but that doesn’t necessarily mean it will be easier to make a trade. They’ve gotten together for eleven trades over the years and most are very minor, Bernie Castro for Kevin Reese stuff. Their most recent sweep was Juan Miranda for Scottie Allen in November 2010, their most notable swap probably D’Angelo Jimenez for Jay Witasick in June 2011. Let’s see what pitchers Arizona can offer the Yankees in the coming weeks. Tomorrow Next week we’ll tackle the position players. The 30-year-old McCarthy is a sabermetrics darling, and you really need to be open-minded to look beyond his 2-10 record and 5.11 ERA. He also owns a 7-21 record with a 4.78 ERA since signing with the D’Backs prior to last year. High school Mike Axisa would have said no way to McCarthy based on that. Behind the record and ERA are some promising core pitching skills, however. McCarthy has a 3.81 FIP during his two years in the desert and this season it’s a 3.88 FIP with his best strikeout (7.53 K/9 and 19.7 K%) and ground ball (55.6%) rates in years. He also never walks anyone (1.56 BB/9 and 4.1 BB%). During his resurgent “hey this guy is a good pitcher now” years with the Athletics from 2011-12, McCarthy had a 3.22 FIP, a 6.26 K/9 (16.9 K%), a 1.57 BB/9 (4.2 BB%), and a 44.3% ground ball rate. The changeup is just a show-me pitch and because McCarthy throws so few four-seam fastballs, I wouldn’t get too excited about that astronomical swing-and-miss rate. (Whiff+ and GB+ are like ERA+, but with swing-and-miss and ground ball rates for individual pitches.) The sinker is clearly his bread-and-butter and it’s an above-average pitch both in terms of getting whiffs and ground balls. Is a guy who relies so heavily on his sinker a good fit for the Yankees’ infield defense? The biggest concern with McCarthy, by far, is his injury history. He has stayed healthy this season but has otherwise visited the disabled list with a shoulder problem at least once every year from 2007-13. Only once since 2006 has McCarthy thrown more 135 innings in a season (180.2 in in 2011) and this year he is already at 104 innings. Maybe he’ll stay healthy, but, given his history, you have to think a disabled list stint is coming at some point. McCarthy is owed approximately $5.1M through the end of the season and will become a free agent this winter, so he’s a pure rental. The fact that he limits walks, keeps the ball on the ground, and is familiar with pitching in a hitter’s park are pluses. The below league average strikeout rate (remember, he’s facing pitchers too) and scary injury history are negatives. McCarthy is an upgrade over Vidal Nuno (and Chase Whitley) and would probably come cheaper than Jason Hammel, another mid-rotation guy with injury issues. Unlike McCarthy, Miley would not be a rental pickup. The 27-year-old is in his third pre-arbitration year and will remain under team control as an arbitration-eligible player through 2017. Usually rebuilding clubs don’t trade a guy like that, but Buster Olney (subs. req’d) recently mentioned many teams are looking to land Doug Fister types — unheralded but effective pitchers with years of control remaining. (The Tigers stole Fister from the Mariners when he was in his second pre-arbitration year.) Miley may fit that bill. Through 18 starts and 113.1 innings this season, Miley has a 4.61 ERA (4.13 FIP). He posted a 3.33 ERA (3.15 FIP) during his first full season in 2012 and followed it up with a 3.55 ERA (3.98 FIP) in 2013, so he is trending in the wrong direction. Miley’s strikeout rate (8.42 K/9 and 22.5 K%) is a career best and both his walk (2.70 BB/9 and 7.2 BB%) and ground ball rates (48.0%) are right at his career norms, so the problem has been the homerun. He went from 0.65 HR/9 (6.9 HR/FB%) in 2012 to 0.93 HR/9 (12.5 HR/FB%) in 2013 to 1.35 HR/9 (16.8 HR/FB%) this year. When he misses his spot, it tends to get hit a long way. The curveball is a non-factor but otherwise Miley uses two fastballs interchangeably and has a well-above-average slider in terms of getting both swings and misses and ground balls. That pitch is why he’s in the big leagues and why left-handed batters have mustered only a 2.88 wOBA against him in his career. Like Fister, there’s nothing flashy about Miley’s pitch mix, no huge fastball or anything like that, but he has four distinct pitches and can make the ball move. Add in his durability and left-handedness and you’ve got a guy who figures to spend a very long time in the league. Third baseman Francisco Martinez, who was in Double-A at the time and considered the fourth best prospect in Detroit’s system by Baseball America. Left-hander Charlie Furbush, who had made his MLB debut earlier that season and been ranked as the team’s 26th best prospect in Baseball America. Right-hander Chance Ruffin, who was Detroit’s supplemental first round pick the previous year. He actually zoomed to the big leagues and made his debut with the Tigers right before the trade. Platoon outfielder Casper Wells, who had about a year in MLB at the time. In hindsight, the Tigers gave up very little. Furbush has settled in as quality left-handed reliever but Martinez, Wells, and Ruffin all flamed out. At the time though? Wowza. Detroit traded one of their top prospects, their supplemental first round pick from the year before, plus two cheap and potentially useful MLB pieces. Imagine if the Yankees were to trade, say, Greg Bird, Ian Clarkin, Jose Ramirez, and Zoilo Almonte for someone like Miley. Fans would probably riot. That’s not an unreasonable package though. Miley’s increasing propensity to give up the long ball is a definite concern, but there is plenty to like here. He’s young, he’s under team control for three more years, he’s never been hurt, he’s left-handed, and he has a true starter’s repertoire. Miley is essentially a finished product — yes, I know every player is always looking to improve, but it’s not like they have to teach him a changeup or something — the Yankees could just plug into the rotation and let him go. Even if you think the Yankees have no business being buyers at the deadline, this is someone they should consider acquiring anyway because he’ll also be able to help in the coming years. Every team can use another reliever, including the Yankees. They’ve had to ride Dellin Betances and Adam Warren pretty hard in recent weeks, partly because Shawn Kelley has been shaky as hell since coming off the disabled list. Closer Addison Reed (4.15 ERA And 4.57 FIP) has been amazingly homer prone (2.08 HR/9 and 18.2 HR/FB%), which is not exactly a good quality for a late-inning reliever. Brad Ziegler (2.34 ERA and 3.52 FIP) is a sinker and ground ball machine (67.2%) who needs a good infield defense to be not awful. Both Oliver Perez (.302 wOBA) and Joe Thatcher (.285 wOBA) are serviceable matchup lefties. Ziegler ($5M) and Perez ($2.5M) are both already under contract for next season while Reed is in his final pre-arbitration year. His arbitration raises figure to be significant because he’ll finish the year with 100+ career saves, significant enough that he might be a non-tender candidate as soon as this winter. Thatcher will be a free agent after the season. Meh. Not really much to see here. The rest of Arizona’s pitching staff is pretty unappealing. Bronson Arroyo is currently on the disabled list with an elbow injury and others like Josh Collmenter, Mike Bolsinger, and Chase Anderson barely move the needle. Trevor Cahill was so bad that he’s currently pitching (not particularly well, either) in the minors. If the D’Backs had more good pitchers, they’d be winning more games. I think McCarthy is a lock to be traded before the deadline for pretty obvious reasons. He makes good money and he’ll be a free agent after the season. That’s exactly the type of player a bad team moves at the deadline. Miley is a different situation though — the D’Backs won’t have any trouble holding onto him if they don’t get an offer they like. The Yankees or any other team would have to pry him loose. Both he and McCarthy make some sense for New York if they’re serious about adding help before the deadline and making a run at a postseason berth.